Basic Fusion Cart is a unique, space-saving solution designed to mobilize and secure expensive computers and equipment. With two independently adjustable, scratch-resistant laminated wood surfaces (12 x 16 and 8" x 24) the Basic Fusion Cart is perfect for users of all heights. The top platform is height-adjustable from 43" to 56" while the lower platform adjusts from 36 to 49 using an easy pop-pin adjustment system. The superb design and solid construction consists of a steel H-shaped base, push handle, rubber-coated casters that lock in place to prevent unwanted movement even when supporting heavy equipment. 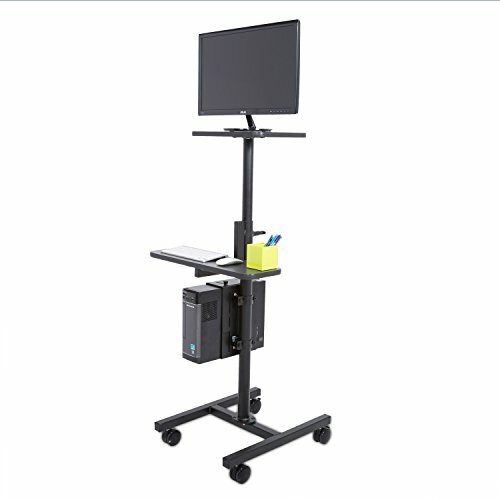 The CPU holder, monitor platform, and keyboard platform also rotate independently allowing the user to tailor the Basic Fusion Cart to his/her needs. If you have any questions about this product by Versa Tables, contact us by completing and submitting the form below. If you are looking for a specif part number, please include it with your message.